Realtek ini sendiri adalah Driver Sound Untuk semua jenis komputer yang kompatible dengan driver sound Realtek ini. Tipe yang kompatible bisa dilihat dibawah. 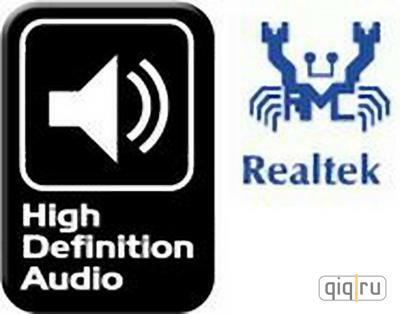 Realtek high definition audio Codec driver this is the sound drivers for a new generation of audio Realtek (HD Audio), namely models ALC882, ALC883, ALC885, ALC888, ALC861VD, ALC660, ALC662, ALC260, ALC262, ALC267, ALC268 and ALC269. The advantages of high definition audio specification before AC ninety-seven include: full support for new audio formats, a high frequency bandwidth, support for connecting audio devices, under Technology Plug and Play, more accurate speech recognition and input. Realtek has always been leading in audio drivers / codes and has come up with high definition Dirvers as well. The Realtek high definition audio driver will provide you with listening capabilities for multichannel sound such as DTS, Dolby and Surround. Now you can experience the movie theater like audio experience inside your room / home. You must have visited theaters equipped with latest sound systems and must have enjoyed great movies that have there sound tracks on DTS, Dolby, Surround Sound. With a high definition audio driver you can recreate the same effect using your PC and speaker systems. 5. Pack with Microsoft high definition audio UAAV1.0a (5013) 2 000 For Windows SP4, XP SP1, XP SP2, Server SP1 2,003.